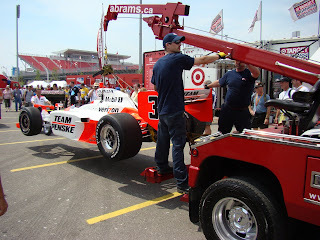 Since the 2009 Honda Indy Toronto concluded nearly a month ago, does it not make sense for me to post part 2 of my trip to the Friday event? I'll just say I was backed up and that I send my apologies to this website's viewer. The good news is that my sunburns have finally resided after a full day at Toronto's CNE grounds on July 10th. With part one of my adventure ending during noontime its prudent to pick up from that moment. By the time I finished my lunch after a long morning of indulging in the Honda Indy festivities, the drivers and teams of the Firestone Indy Lights series complete their second practice of the day; this second and final session before later afternoon qualifying. Australia's James Davidson topped the session during the last minute of practice with a 1:05.5191 second lap. While not evident by the throaty engine notes and their aggression around 11-turn street course, the Firestone Indy Lights car will show themselves four seconds slower lap speed to the IndyCar series when timing is settled for the day. Another noteworthy driver rounding out the practice session is hometown favourite 24 year old James Hinchcliffe placed fifth fastest. As the Indy Light cars depart the track, the showcase was given to a the nostalgic grouping of the Vintage and Historic GT race practice. Perhaps a refreshing taste from the flooding servings of open wheel racing, these classic vehicles are built to compete in sports car racing of the 60s, 70s, and into the 1980s. With the newest car being a 1989 Pontiac Firebird, the oldest entry is an elegant Jaguar E Type from 1963. Regrettably, their half hour session involved very few green flag laps for the day. Through much as the brief session a blue #17 car, a 1966 Ford Mustang, struggled to leave pit lane as crew members made a feverish attempt to give Matt Fusillo and his car track time. Admiring these classic performance cars as they briefly reunite with their pedigree of speed, the practice fortunately ended without the loss of any of these machines. As the Vintage and Historic GT cars depart back into their paddock area inside the Direct Energy Center, the IndyCar open wheel racers take back to the track for an afternoon practice. With Penske's Will Power leading the first session, this second chance to find speed was an opportunity to improve on any morning struggles or back up their previous fast times on the warmer, faster Toronto street circuit. The session contained a few additional moments of excitement for two drivers. The first involved 2005 IndyCar champion Dan Wheldon looping his #4 National Guard car when negotiating the difficult turn 3 after the fast stretch of Lakeshore Blvd. No damage came to Wheldon's spin, but the second major incident of the session would not end so fortunately for one of the Penske cars. Helio Castroneves made some on track contact which resulted in damage along the right front corner of his red and white #3 race car. In a minor surprise, the top of the speed chart of the second IndyCar practice was rookie driver Raphael Matos who appeared in the top two for both IndyCar prep sessions. Justin Wilson and his Dale Coyne racing team found some considerable speed as her vaulted himself from 12th in the first IndyCar practice to 2nd in the afternoon session. Will Power, Robert Doombos, and Ryan Briscoe rounded out the top 5 speeds. After posting 5th fastest time, Paul Tracy's #15 Ontario Honda Dealers/Woundedwarriors.ca team slipped to 13th overall in the afternoon practice. With only the Toronto and Edmonton race planned with KV Racing, Paul Tracy committed “in the afternoon we tried a few things for the race setup that didn't work for the car, so we lost our way a little bit”. Tracy continued to say that we felt confident about Saturday qualifying for the Sunday main event. Of course, between the time of the Friday practice and when this posting is being completed, we know about the Sunday event resulting in a race ending crash between Helio Castroneves and Paul Tracy. While as a fellow Canadian, I wasn't thinking too highly of Castroneves at the moment when he was attempting to hold his position on worn tires, but watching his interview being held shortly after a chorus of boos from the grandstand full of Canadian flag race fans made me quickly sympathize with the Brazilian driver. Being very apologetic by the incident with Tracy, Helio Castroneves seemed almost saddened to bring such displeasure to the Toronto crowd. Following the Friday afternoon practice session I can almost guarantee him to be fan's racer. At the end of the practice, Helio rode with his crew members on the team cart as his car was due to arrive to the attention of Penske's mechanics. Considering the fact that some race car drivers take even minor vehicle damage seriously, a crowd of race fans saw a chivalrous Helio Castroneves who signed autographs and posed for photographs with dozens of fans with a smile on his face. Just as he was relishing the fanfare his damaged Penske Dallara-Honda was being guided into the paddock area by a tow truck. On the other side of the Paddock, one of the biggest fan draws was Danica Patrick. With hundreds of people standing around her car at all times, Danica made herself scarce through the day's racing activities as she lent little time to converse with fans. Perhaps of victim of her own success, the sports star and the model provocative Godaddy.com ads is sought over by adoring fans who holds no ill feelings for the most popular woman in motorsports. Danica Patrick's on track performance on the street course may have been a concern for her, an ultra-competitive driver who trailed all but two other drivers in the final practice of the day. However, while Patrick never gained the speed she needed for qualifying on Saturday, she survived the chaos of Sunday's race for a resurgent sixth-place finish. With the leading series' on track activities wrapped up for the day, the feeder series of Firestone Indy Lights championship set out at 3:10 for a 45 minute qualifying match. Columbian 19 year old Sebastian Saavedra grabbed the pole mid way in the session and held on to the coveted spot for Saturday's race. James Hinchcliffe's came close to the pole coming less than two-tenths of a second away from Saavedra mark. Falling just short of the first place starting position for his hometown race, his efforts was applauded from the grandstands as he achieved greatness through merely a hearted attempt. As a finale for the four-wheel proceeding of Friday, the Castrol Canadian Touring Car Championship presented by Toyo Tires take to the 1.721 mile street circuit for the second time of the day for their qualifying. Their practice at 8:00 am provided the first engines to voice the festivities of the waterfront race competitions. Featuring an eclectic group of Honda Civics, BMW 3 series, Saab 93, and even a pair of Hyundai Genesis coupes, 43 cars of these Canadian tour compete within two classes. During the qualifying, Gregory Pootmans took his BMW 328 to the pole position for two races held on Saturday afternoon and Sunday morning at an average speed of 124.273 kilometers per hour (75.73 miles per hour). The close automobiles to what would be seen along the street race route during the majority of the year, these Canadian Touring Cars were obviously tested. Spinning within the turn 10 and 11 complex, the #64 Lexus IS300 of Andrew Wojteczko (which placed second in the morning practice) quickly recovered without contact. Wojiteczko's Lexus would place 4th overall in the timed session. As the Castrol Canadian Touring Car Championship concluded after just half an hour, I began to make my trek back home via the TTC streetcar. This trail went through one last visit to the Direct Energy Center where I partook in purchasing a few well-priced items at the vendor area. In days passing, I've been attempting to gather information on the attendance for the 2009 Honda Indy weekend but has noticed that some news outlets were unable to obtain this data. Knowing that the race in its prime years of the 1990s drew between 130,000 to 150,000 spectators for the three-day event, estimates have placed attendance lower for 2009. Not surprising for the result of a higher Canadian dollar and a less than favourable economic picture forcing some belt tightening, the 2009 Honda Indy event would be no less of a casualty than the majority of auto races. There was also a threat of weather on the Saturday morning which likely injured the gate sales during that day. However, as a witness to the beautiful weather of the Friday action at the CNE grounds I can attest that the crowd appeared to be right on par with Fridays of yesteryear editions of the Toronto race. With that ended my day at the 2009 Honda Indy and my first time back at the Toronto Indy car race since 2003. I forgot how much I missed it, feeling only relieved that this year's event brought a strong, reunified presentation of open wheel racing.